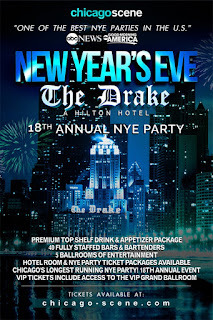 Join 3000 people as they celebrate the Hottest New Year’s Eve Party in style at the historic Drake Hotel. Voted 'Best Chicago New Year's Eve Party' by ABC's Good Morning America, NBC, Redeye Chicago. Party Vegas Style with 5 ballrooms of Chicago's best entertainment. The best local DJ’s keeps the party dancing through the New Year. Incredible Sound System, Light show, Balloon Drop and Midnight Champagne Toast. Premium Top Shelf Spirits and Drinks, with over 40 fully staffed bars, Chef’s Selection of Hors d’Oeuvres and Buffet. The Drake Hotel is Chicago’s Best New Year’s Party Venue and location in Chicago on the Magnificent Mile at the corner of Michigan Ave. and Oak Street overlooking the famous Lake Shore Drive and Lake Michigan. Many celebrities and local sports stars have celebrated the New Year at our party as well as the who’s who of Chicago. Big Ten grads say “It’s the Number One New Year’s Party for Big Ten Alumni in the City of Chicago”, we hear every year from many guests “That everyone from our College is here”. The main ages range of our guests are from 21-35 and go up to people in their 40’s and 50’s. 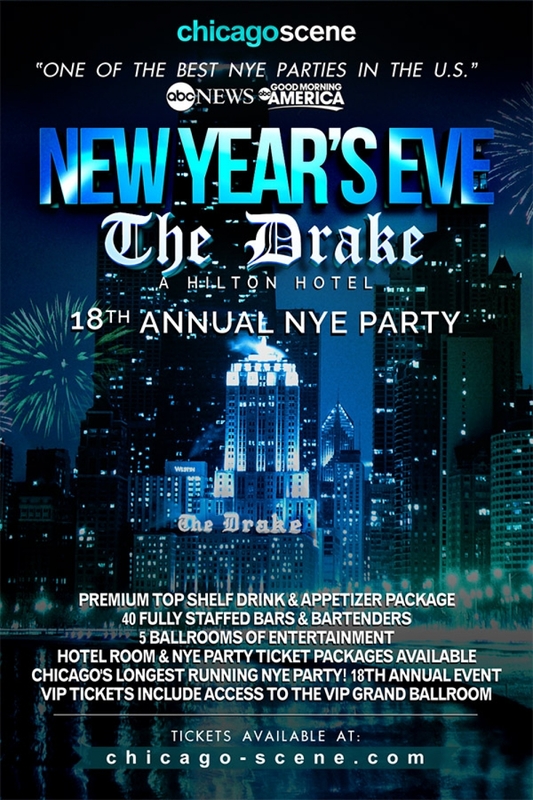 Tickets for the New Year’s Eve Party at the Drake Hotel are on sale Now! General admission tickets start at $135 and VIP tickets start at $155. The party begins 8PM for VIP and 9PM for GA ticket holders on Sunday, December 31, 2017. General admission tickets include five ballrooms of entertainment, over 40 fully staffed bars, premium hors d’oeuvres, dessert and coffee buffet, and complimentary party favors, hats and noisemakers. Guests will also enjoy a midnight champagne toast and balloon drop in the Gold Coast Room and Grand Ballroom. The VIP ticket, in addition to everything previously mentioned include access to the VIP Grand Ballroom Bars open from 8 p.m. to 1:30 a.m. This year we have more Reserved VIP Table options then ever before. The tables include Reserved Tables, Bottle Service in Gold Coast Ballroom, VIP Grand Ballroom, French Room, Drake Room , Drake Bros. Restaurant, Georgian, Venetian and Walton Rooms. Prices range from $195 to $395 per person. We have Party and Hotel Room Packages with both GA and VIP tickets available now. 5 Ballrooms of Entertainment playing all types of music from House, Dance, Hip Hop, Rock, Retro and Motown, including some of Chicago’s Hottest DJ’s: Sye Young, Charles Protégé, Justin Dahl, Orion Roswell, On Drums, Bam Bam Buddha and Miro. Chicago Scene is known for its hugely popular events attended by thousands of Chicagoans, including the Chicago Scene Boat party and many other events, Chicago Scene invites Chicagoans and tourist alike to experience the hottest party of the year and ring in 2018 with style. Launched in 1998 by Ted Widen, ChicagoScene.com was one of the first social networking, events and entertainment sites in the country. Chicago Scene publishes Scene Magazine and is known for unparalleled event and production, producing such events as the Chicago Scene Boat Party, one of the largest boat parties in the country, Craft Beer Festivals and many other events.